Today is truly an awesome day as Merial and I head off to celebrate our 30th Wedding Anniversary. Although our actual anniversary day is in June, that would be the heart of our local diving season, so it is a lot easier for us to get away in January. We are off on a Caribbean Cruise on the Royal Caribbean ADVENTURE OF THE SEAS. Royal Caribbean cruise line is our favorite and this will be a very special trip. Will there be diving mixed in with our island adventures? Oh yeah! So sitting on the plane during our close to 4 hour plane trip to Puerto Rico, where we will meet the ADVENTURE OF THE SEAS, I decided to pen this blog on Cruise Line Diving, considerations and planning, choosing a dive operation, and execution. I’ll also share our choices for this adventure and how it worked out. As we are living very busy lives these days, like many, we most often find ourselves doing last minute planning, packing and panicking….This cruise has been planned for over year and it still seemed to sneak up on us! Only four days ago we realized that we had not planned any of our excursions and the signup deadline was upon us. So at 1030PM we sat down together and reviewed all of our options for each of our port visits. The only thing we knew for sure was that we wanted to dive. But where? The first place we started to answer that question….late at night, hours before signup closed was the Sport Diver Website. On that website we did a search on the locations we would visit and checked out the articles that were referenced. From those articles we were able to get a good feel for what type of diving was available and what we might encounter and see. Cool – narrowed the list. The next questions to get answered were, which of these locations offered diving thru the cruise line and in which ports do we want to dive….and do those two lists match? We hit 50/50 on that one. The Cruise Line only had one port that had diving and it was on our “must dive” list derived from Sport Diver and that was St. Croix. No worries, we are PADI divers and that means we have easy access to quality dive operations around the world. A simple web search on the PADI website and we had a short list of operations that were at our “must dive” locations. We selected Antigua. Grab the phone numbers and vow to call them in the morning. But now we needed to focus on signing up for St. Croix. 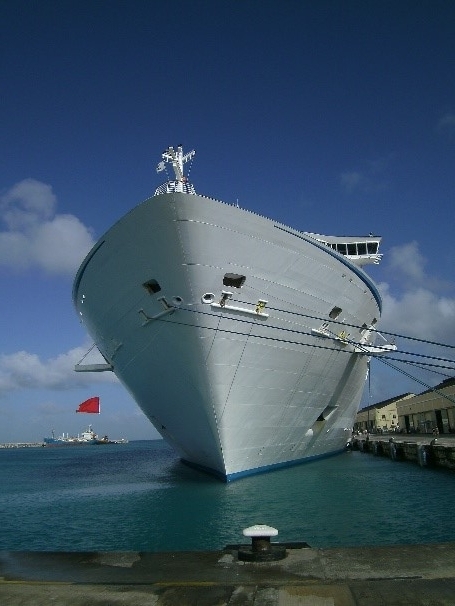 Now some divers will tell you that they never use the Cruise Line operations because they are overpriced….frankly that is generally just paranoia. From our experience and from others I’ve spoken with, it is a gross generalization. The Cruise Lines contract these guys based on customer satisfaction, and support for the ship’s schedule. Some of the other local “Cheaper” options are of lower quality and customer service and you might find yourself frantically trying to get back to the ship before sail. If you are going to pick a non-cruise line sanctioned operation do your research. That said, the cruise line offerings may not be the type of diving you are looking for. Many cater to the once or twice a year diver….read the write up and call ahead if you are unsure. Whew! Met the deadline, including setting up some zip-lining, wine tasting and a couple’s massage appointment! So, we’ve selected our Dive locations and made our reservations. Next question: What gear, if any, do we bring? We’ve done it both ways. We have taken all out our gear, like you might on a Dive Trip Vacation. And we’ve done cruises where we have taken none of our own gear….just bathing suits. You can make either work, but when you make your plan, ensure that you check out whether the Dive Excursion you chose includes the gear in the price. Some will stick you later with rental charges that you will need to be prepared for. Additionally, if you are planning to do any Snorkeling or beaching at other ports, bringing your personal gear, mask, fins, snorkel and booties may make a lot of sense. This trip we chose to bring the minimum plus wet suits….we had two special dinners planned and need the extra room and weight for dress clothes. Now on to the diving, as our first stop was Barbados and then St. Lucia. 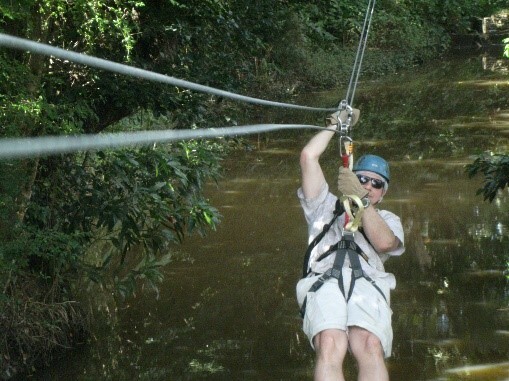 We chose 4X4 cave and land tours on Barbados and Zip-lining in St Lucia….both were truly awesome experiences. The Zip-lining in particular was a definite “Do-Again!” Also, others on ou r Cruise opted for Snorkeling in St Lucia and raved about it. So even though the Cruise Line didn’t offer diving there, we might just have to give it a try next time. Our first diving opportunity for diving was in Antigua. Antigua offered a variety of reefs for diving and opportunities to see Reef, Nurse and Black Tip Sharks. The Dive boat was operated by Indigo Divers and was a 6 pack, neat and clean with a Captain and a Divemaster. It was a very rough day with winds in excess of 20kts which made for a sporty diving day, the boat went typically to only one site called “Double Dip.” All in all a nice operation….but….The BCDs provided were all entry level, some without integrated weights…which meant weight belts. The regulators were well used and mine breathed very wet during the dives. Also there was no accommodations for photographers, i.e. no camera rinse bucket. Finally, the ladder had no hand holds above deck which meant you were crawling back onto deck, which again made it sporty on such a rough day. I decided that I missed my BCD and Regulator that day. “Double Dip” was the only dive site used typically because the boat could anchor once and dive two different reef. Nice idea, unless the weather there was less than optimum…which it was. Despite any inconveniences, pretty good diving. With the high winds and rough seas, the visibility was about 60 ft. The Reefs were full of small fishes, but the coral was fairly broken up. 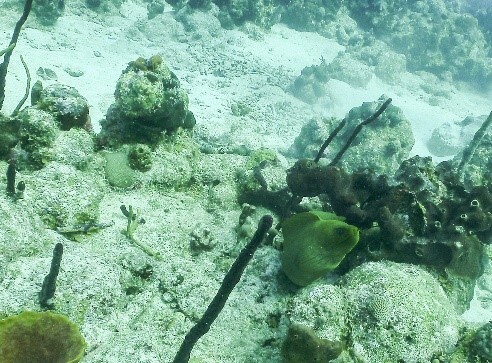 We did see sharks and Lobsters and a Lion Fish which was speared by the DiveMaster and fed to a reef shark. I think we’ll beach it if we go back to Antigua. The next day was St Martins….very beautiful. Still very windy but nice and sunny. While it definitely had the potential for great diving, we would likely have had to travel to the leeward side of the Island. We opted for Shopping, Beaching and then Hot-Tub-ing back on the ship! The final port visit was in St Croix where we opted to use the Cruise Line Selected Dive Operation which was the Cane Bay Dive Shop. They met us at the pier, where we filled out our liability paperwork before we walked down to the waiting Dive Boat, the ISYS. Very convenient and the day was beautiful! We were issued our BCDs and Regulators. Of note here, I needed a Large BCD and they were short on them so I dove a Medium….Yep I fit, but barely. But it was in very good condition, had integrated weights and the Regulators were in great shape as well. Dive boat was a 12 pack and had a restroom and camera rinse tank. The water was absolutely clear and beautiful. Easily 100ft visibility. The dive sites (2) were no more than 15 minutes from the pier. The first dive was Wreck Junction which featured three separate wrecks on one dive with maximum depth of 70 feet and working shallower. Lots of rays, fish, garden eels, puffers and a turtle. All that you would dream Caribbean diving would be. The next dive was a reef dive. Maximum depth was 50 feet with very healthy soft and hard corals, giant Barrel Sponges and a multitude of fishes and eels. A very pleasant dive and a great one for Photographers. There were two DiveMasters in the water, one led the other followed. All in all a perfect Cruise Ship Dive, convenient, beautiful and fun. The gear was quite adequate and no additional transportation was required. A definite “Do-Again” dive. Now we are on our way back from paradise and with a 4 hour layover in the airport, we’ve had plenty of time to reflect. While you cannot control the weather, you can certainly try to accommodate it. 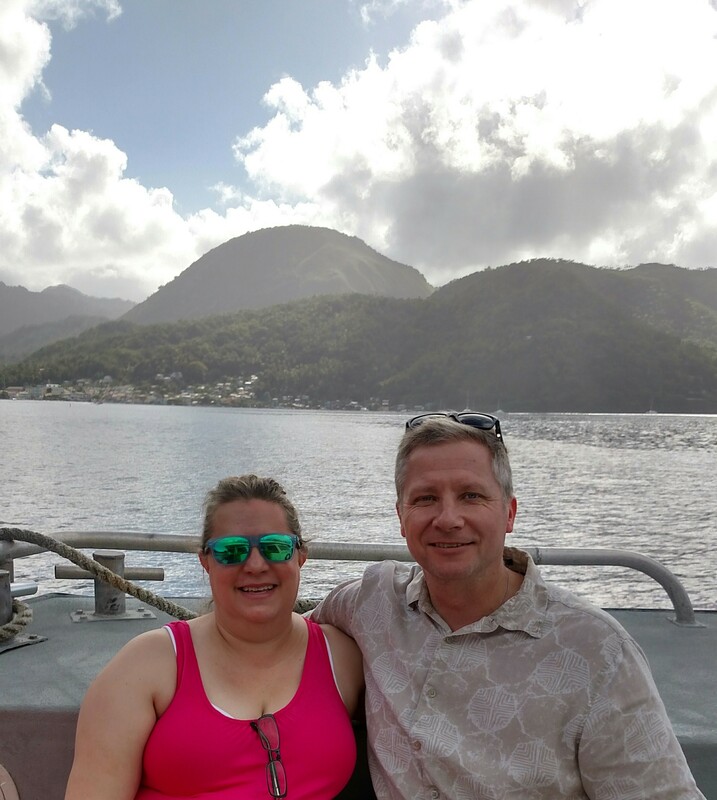 Considering our experience in Antigua, we should have asked about their rough weather plans before we booked, and got a little more information on the boat. Additionally, in hind sight, we could have engaged folks on Scuba Earth to see what others had thought. In Saint Croix, there was an actual Dive Shop associated with the boat and they had a number of dive sites to choose from, based on the weather. In both cases we found reason to miss our personal gear, BCDs and Regulators. I did find it very convenient to have a wrist computer (Sherwood Amphos) with us on the dives for dive planning and monitoring. Especially when the diving conditions may not be optimal, having familiar gear reduces the stress, even with seasoned divers. We may have to invest in Travel BCDs…..Hmmm, another reason to get more gear! We are already planning our next Cruise Dives. They won’t replace our Dive Trips, but they surely help us check out places to dive that we might not have chosen before, and a great way to spend some personal time together with your cruise mates.